Sunday's are usually meant for brunch, football and recovery from the weekend debauchery that NYC can provide at times. However this past Sunday a Dekalb Market, New Yorkers decided that this time they'd do things a little differently. 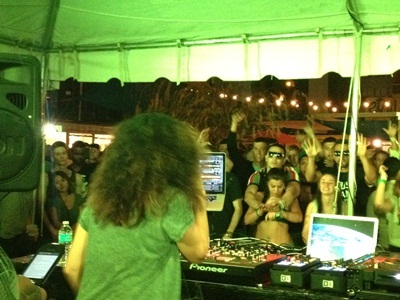 Nicole Moudaber dubbed as the queen of techno (by Carl Cox himself) popped into Brooklyn to give what was a (too) short but incredibly sweet set. Fresh off the plane from a long set in Montreal just a few hours prior she, accompanied by New York’s own Beat Bros, threw down what was a dope combination of beats specifically made for a Sunday evening. Nicole’s crowd sometimes attracts a different kind of listener but mainly it attracts all those who are ready to be both get funky AND be free, as well as dance as long as they can. Nicole's set delivered an energy that is extremely unique and unprecedented. However, unlike some of her DJ colleagues, her delivery of the rhythm is extremely smooth, enticing and above all exciting. Dekalb market was nearly full at the portion in which it holds its dance-floor, both dancers and local vendors vibed together in a way that both expressed the culture of techno and the culture of a Sunday gig in Brooklyn. It was almost as though the gig itself was actually happening in your backyard, just for you. The amount of dancing from a few newcomers and some old-school die-hard, techno loving New Yorkers cheered on by the "Dance.Here.Now." crowd hosted by Anthony LaMont made for an extremely comfortable and more than expressive environment in which we were all encouraged to be themselves. On that front the music made sure that there was no shortage of original characters. Perhaps there was no moment greater to express such a feeling than when Nicole dropped a remix of Mark Knight's "Nothing Matters" did the entire venue indeed display that all was right with the world in this moment, in this place. Nicole of course in her way was more than courteous to the NY Fans (myself included) during the gig and then well after. Talking to a few lucky fans, taking tons of photos and giving her fans tons of love, Nicole’s incredible friendliness to these Brooklyn party goers was more than heartfelt and definitely left people wanting more. Though too short for many of us, we were happy to hear that Nicole will be back in NYC on the 6th of October for another round of "the queen of techno" accompanied by none other than New York’s own legend, Victor Calderone. These two combined will most likely turn Pacha upside down with a sound that is only make you meant to do one thing, keep moving . Review for CGNY by Jarobin Guerra.